Walt Disney had already made quite a few action adventure films by 1960, so audiences should have come to expect this type of movie from him. As in most of his previous efforts, he once again turned to classic literature as his source material. This time a novel called Kidnapped by Robert Louis Stevenson. The first all live action Disney film was another Stevenson adaptation, Treasure Island. Walt chose a familiar director in Robert Stevenson, who had previously directed Johnny Tremain, Old Yeller, Darby O'Gill and the Little People in aditon to episodes of Zorro. He would go on to be Walt's primary director, eventually directing Mary Poppins. Peter Finch was a famous actor in England and was familiar to the Disney studio since he played the Sheriff of Nottingham in Disney's The Story of Robin Hood. James MacArthur was still under contract with Disney, having already starred in The Light in the Forest and Third Man on the Mountain. 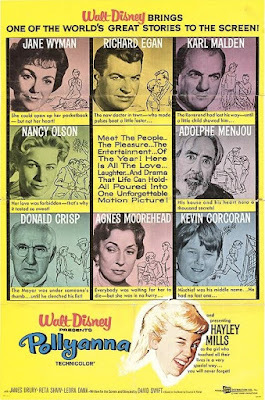 Like Disney's earliest live action films, Walt chose to shoot on location in the UK and hired a primarily English cast and crew. When David Balfour's father dies, he is sent to live with his Uncle Ebenezer. When David learns that his uncle has stolen his father's property that should belong to him, Ebenezer tricks him into boarding a ship intent on selling him into servitude. The ship ends up colliding with another boat and they are forced to take on the lone survivor, Alan Breck Stewart. David leans of a plot to kill Alan and warns him. Together they take over the ship and Alan convinces David to help him get to land outside of the British ruling. To return the favor, Alan helps get a confession out of Ebenezer so that David can have the property and money his father left for him. The film ends as Alan leaves David to go on another adventure. 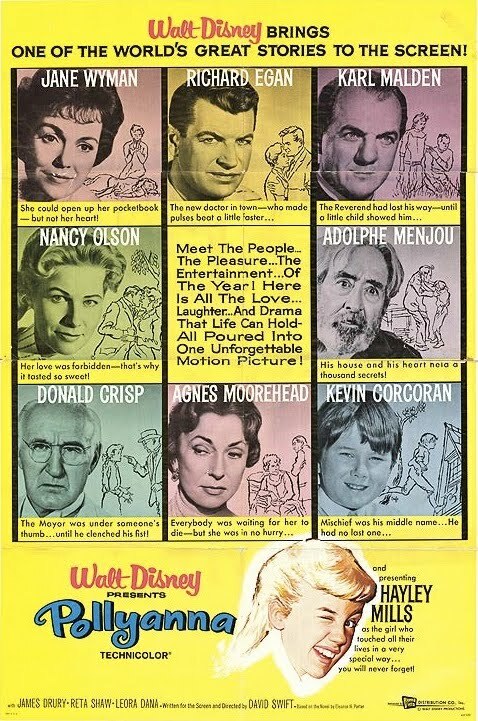 Kidnapped was released on March 25th, 1960, although some cities opened it earlier on February 24th. US critics agreed that it was well made, but the general consensus was that for an adventure film it was rather dull. There were also complaints that the story was at times unclear and confusing to viewers. It found little success in the states. In the UK, however, critics praised it for staying truthful to the literary classic on which it was based and it enjoyed much more success there. While I tend to agree with the US critics on their opinion of Kidnapped being somewhat dull and having a few scenes that slow the story down, I also enjoy the film. I feel it has enough redeeming qualities to outweigh the negatives. It has great performances by all of the cast, including Peter O'Tool in a in his first on-screen role. It is incredibly well made and the location shooting really adds to the visual richness of the film. And Peter Ellenshaw delivers some great matte paintings to deliver some of the more impossible shots. 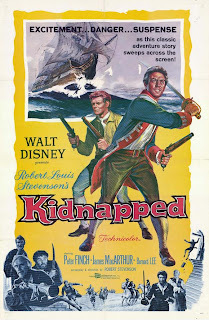 If you're a fan of other Disney adventure films from this era, you're sure to enjoy Kidnapped as well. 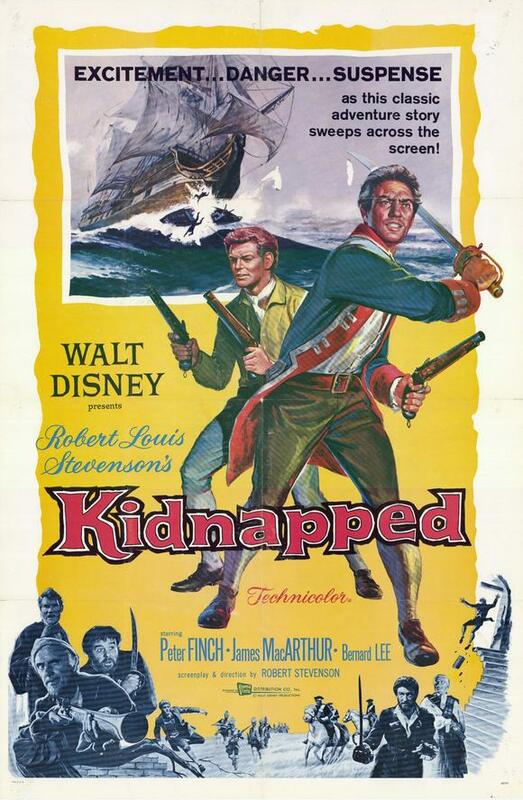 Kidnapped was released on DVD in as a Disney Movie Club Exclusive. A wider release hasn't been given yet. Like most DMC Exclusive DVDs, this film has no bonus features, or even chapter listings. The transfer is the same one used from the VHS, so the film is plagued by excess grain, color flickering and artifacts that a restoration would have helped. The film is also presented in fullscreen, which was likely not it's original theatrical aspect ratio since by this time most films were released in widescreen. However, we are lucky to have access to this film at all. The film is also available on iTunes, where it is also in fullscreen. Walt Disney loved making movies about the turn of the century most likely because it reminded him of his own childhood. He made quite a few during his lifetime, but Toby Tyler stands out as one of the best. The film is based on a children's book of the same title by James Otis Kaler, which was published in 1880. It is possible that Walt read this book as a child, which may have sparked his interest in adapting it as a feature. Charles Barton was brought on to direct after having spent several years at Disney directing episodes of Zorro in addition to installments of the Disneyland series and most notably, The Shaggy Dog. Kevin Corcoran headlined the film as Toby after already making a name for himself at Disney. By this time, he had already starred in Old Yeller and The Shaggy Dog in addition to becoming a regular member of The Mickey Mouse Club, where he was known as "Moochie." Gene Sheldon and Henry Calvin would also have been familiar faces due to their supporting roles on Zorro. Most of the movie was shot at Disney's Golden Oak Ranch, with city scenes being filmed on the backlot at the Disney Studios. Toby Tyler is an orphan boy taken in by his poor aunt and uncle. He gets in trouble for neglecting his chores when the circus comes to town, causing his uncle to say things he doesn't mean. 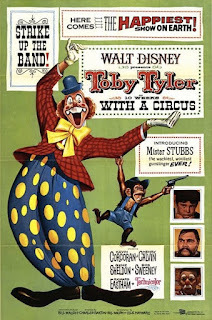 As a result, Toby runs away to join the circus. He is hired by the head Concession salesman (a "concessionaire") and is treated as an outcast by the other circus children, who are performers. He manages to make friends with a few adults and a chimp named Mr. Stubs. Toby gets his moment to shine when one of the horse riders gets injured and he fills his place as a performer. When he learns that his uncle is sick, he runs away with Mr. Stubs. After some commotion, he and Mr. Stubs return to the circus where his aunt and uncle have heard of his success and come to see him perform. 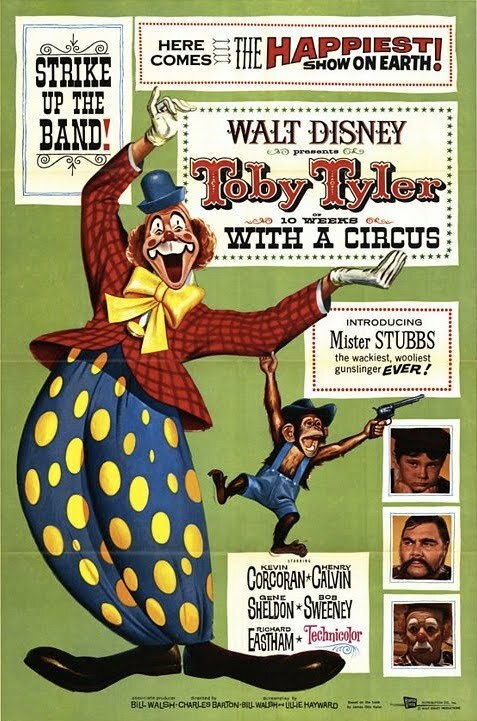 Toby Tyler, or Ten Weeks with a Circus was released on January 21st, 1960. Critics raved about the film, praising Disney for his simplistic representation of circus life. Despite critical acclaim, Toby Tyler failed to find success at the box office. It was never re-released theatrically, but enjoyed some success in TV airings. I first saw Toby Tyler as a kid when my mom rented it for me. I instantly fell in love with it. In fact, I hid the VHS and told my mom I lost it so that I could keep it, since it wasn't available for sale to the general public. And while this film is sure to delight children, it packs a lot of charm and humor for adults as well. I've seen it more times than I can count and I still enjoy it a lot. Disney fans should note that the credits say "Introducing Ollie Wallace." Oliver Wallace was Walt Disney's main composer and he wrote the score for most Disney films of this era. In the film, he plays the orchestra conductor. If you ever find yourself in Baraboo, WI, be sure to visit the Circus World Museum. The historic circus wagons that Walt Disney bought and refurbished for Toby Tyler and later reused in parades at Disneyland have retired there. Toby Tyler was released on DVD in 2005 and is still available in that format. As is typical for Disney's DVD releases for older films, the DVD doesn't contain any bonus features. In addition, most Disney films of this time were filmed in fullscreen with the intentions of being matted into widescreen in theaters. The DVD presents the fullscreen version, which is not the original theatrical ratio. It is available on iTunes in widescreen, where it is also available in HD.